Amundi has developed a platform of research services covering all aspects of investment research supporting domestic and international investment teams (our internal clients), and servicing all types of – external – clients: corporates, pension funds, insurance companies, central banks and Sovereign Wealth Funds, retail clients, banking networks, external distributors… This research platform boasts more than 150 international experts, disseminated within portfolio management business lines (embedded research) and within the central research team. 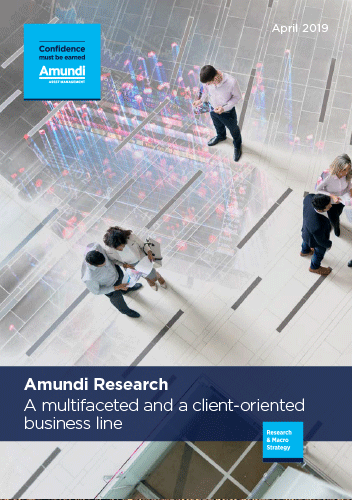 Amundi’s research teams work closely with in-house fund management teams & advisory services contributing to portfolio reviews, sector reviews, internal rating, target prices. As part of Amundi’s investment committees, the teams play a key role in portfolio construction & optimisation, asset allocation and relative value trades.The Hub concept facilitates interaction among the providers of expertise, between providers and fund managers, and with the rest of Amundi.